Video games are an interactive medium, this is part of their very nature. An interesting aspect of the hobby is that, short of bundling a controller with the game, the creators of the games don’t get much of a say in how we interact with their creations. Further, a robust market of third party manufacturers makes it so that even the companies responsible for producing the gaming consoles themselves don’t get the final say in the form and function of the input devices we use to play games on their hardware. All of this is to say that anyone who collects games likely has a plethora of control options beyond those that shipped with their systems at their disposal, from cheaper knock offs of the first party controllers to options specialized for certain games to true oddities that purport to improve on some short coming of the more standard options. In each article in the Control Issues series, we will take a deep look at a particular controller and then try to evaluate it in terms of both form and function. Believe me, this thing feels worse than it looks (and it looks pretty bad). In this Control Issues, we are taking a look at product of Transcriber Company Incorporated: The Faster Blaster. This is one of the oddest controllers that I have in my personal collection. As a controller for the Atari VCS and other systems that use that controller standard, you could be forgiven for thinking that this is simply a cheap third party keyboard controller replacement with an overlay. The truth, however, is much worse. First, the build quality of the Faster Blaster is atrocious. Rather that the hard plastic shells favored by pretty much all other manufacturers, Transcriber decided to use a cheap, flimsy feeling plastic that seems only slightly stronger than the kind of plastic that things are regularly packaged in. The Faster Blaster literally bends and flexes in normal use. Making matters worse, the front is not an overlay; it is a membrane keypad that maps out the functions of a normal Atari joystick. All of the function with none of the tactile feedback. So, accepting that it is cheaply made and bizarre in form, why does the Faster Blaster exist? 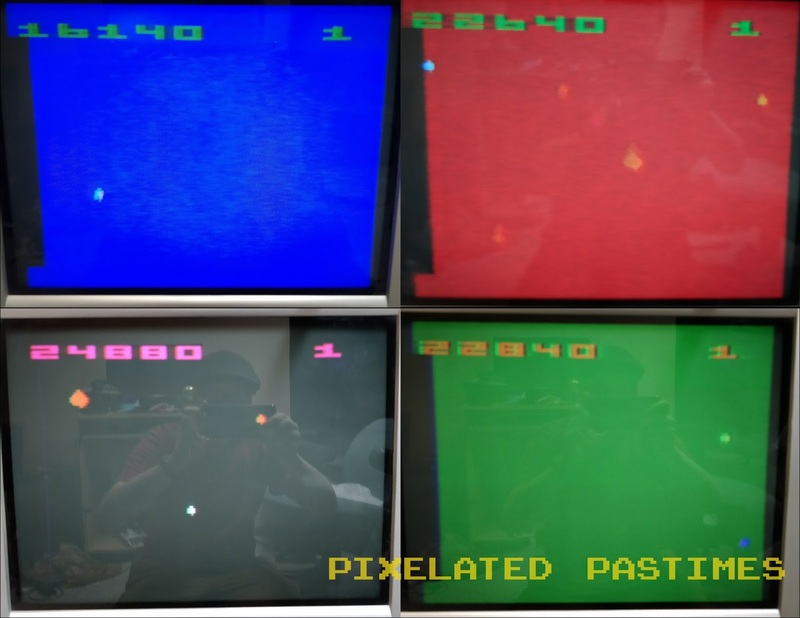 To answer that question one must take a look at one of Atari’s most popular arcade games. 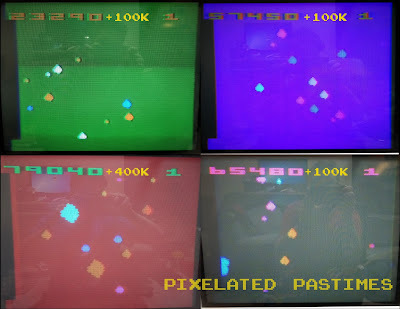 Released in 1979, Asteroids was a sensation; so much so that multiple Lunar Lander cabinets were converted to Asteroids late on the production line to try to keep up with demand. One of the unique features of Asteroids to bear in mind is that it did not use a joystick in the arcade. Rather, its control panel featured an array of five buttons: rotate left, rotate right, hyperspace, thrust, and fire. Given the game’s popularity home conversions were inevitable and Atari did a good job of logically mapping the games five buttons to the standard joystick controller (something not achieved by CBS Electronics in Omega Race). Despite Atari’s skillful remapping, third parties saw an opportunity to cash in by providing players with controllers that replicated the five discrete buttons of the arcade cabinet. 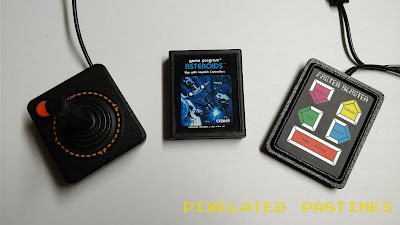 These ranged from well done attempts like the Starplex Deluxe Video Game Controller (itself a candidate for a future edition of Control Issues) to shallow cash grabs like the Faster Blaster. The CX-40 and the Faster Blaster will square off in the most noble of arenas: the 2600 port of Asteroids. At this point, the only thing left to do is to find out how well the Faster Blaster works and whether it lives up to its box’s claims of “ultra-fast firing” and “higher scores”. I can think of no better test than the game responsible for the Faster Blaster's existence, the 2600 port of Asteroids. This is one of my favorite games (actually the first game I ever played) and I can regularly wrap the score around multiple times while playing on Game 1 with UFOs and satellites enabled. This is one of the games that I am actually fairly competitive on and I would welcome the Faster Blaster with open arms, assuming it does actually provide an edge. 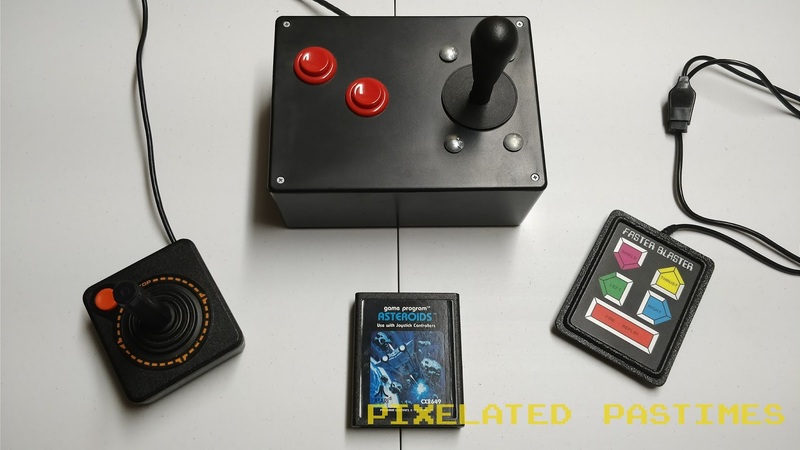 To find out if this is the case I will be playing eight games of Asteroids with the aforementioned settings. Four of these games will be played with the joystick that shipped with the console, the Atari CX-40, and the other four will be played with the Faster Blaster. After each set of four games, I’ll average the scores and discuss the experience to try to capture some of the feel of using each controller. I am somewhat rusty with the CX-40 but I feel like this is a respectable showing nonetheless. At the end of four games with the CX-40, I ended up with an average score of 231,315 points. I feel pretty good about this run. After all, the CX-40 is not the controller I use most often when playing the 2600 (that would be a controller of my own design). Given that, I was struck by some of the peculiarities of the CX-40. There is very little play in the CX-40; the stick barely moves. However, in spite of the low play, due to the internal design of the controller, the CX-40 can still feel unresponsive. That being said, the CX-40 is still a perfectly serviceable control option. My third game proves that the CX-40 doesn’t prevent you from getting in to the zone and making a great run on a game. All four of the games I played with the CX-40 involved precise use of thrust to weave between the titular asteroids and a judicious use of hyperspace to escape certain doom. While it won’t be replacing my home-built controller anytime soon, the CX-40 provides a solid baseline for comparison. I feel like I barely need to say anything to drive home how abysmal the Faster Blaster is. The scores really do speak for themselves. I went from at least wrapping the score around once with a controller that I don’t regularly use to not even breaking 25,000 with an average of 21,625. That is over 200,000 points less than the CX-40 average. While I feel like I could just stop there, I am going to attempt to describe just how terrible playing with the Faster Blaster really is. Other membrane keyboard based devices often have a raised edge around the buttons or other tactile addition so that you can tell roughly where your thumbs are without having to look. Transcriber Company felt no such need. 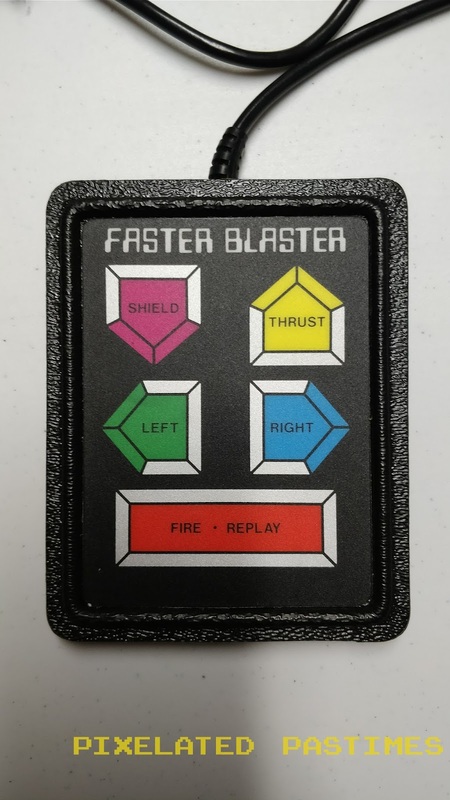 The entire keypad on the Faster Blaster is totally smooth making figuring out where each button is in the middle of each game a panicked nightmare. Every one of my games featured moments of me jabbing blindly at the Faster Blaster in the vague hope of just rotating in time to blast away an asteroid, let alone activating thrust or hyperspace. This controller was truly ahead of its time, bringing the horror of smartphone touch controls to an eighties home console. As an added bonus, the cord on the Faster Blaster is even shorter than the one on the CX-40, which wasn’t winning any awards for cord length itself. While the CX-40 is leagues ahead of the Faster Blaster, neither will be replacing the arcade grade components of my home-built beauty any time soon. The Faster Blaster is emblematic of the kind of blind rush to get into the video game industry that led to the Crash of ‘83. Everything about the Faster Blaster screams rushed and half-assed. The build quality is terrible and the design is poorly thought out. The Faster Blaster existed solely to try to grab a part of the flood of video game cash that was flowing in the pre-crash years. The only reason to own a Faster Blaster is as a curiosity. It is so poorly conceived and executed that it can serve as a conversation starter. That said, I ended up with the two that I own because they were part of a lot of Atari controllers that I won on eBay. If they hadn’t come in to my possession that way, I am fairly confident that I would not have sought them out. Their awfulness simply outweighs their novelty. That will do it for this one. Thanks for joining me for the inaugural edition of Control Issues. I hope to see you back here next time. If you have any suggestions for unique controllers that you would like to see me take a look at in future editions drop them in the comments.